The salutations services are chanted by the faithful in honor and commemoration of the Holy Trinity, the Most Holy Virgin Mary or a particular Saint. As our parish is named in honor of our patrons, the Holy Apostles, we offer to you this prayer to use in your personal devotions. 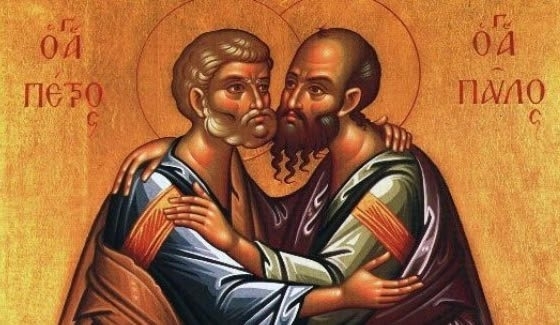 May Saints Peter and Paul intercede for us all, with all the Holy Apostles! The tradition of asking the Virgin Mary and the Saints to intercede for us with Christ our God has its roots in Sacred Scripture and throughout the tradition of the Christian faith. The Lord Who said of Himself: I am the good Shepherd, said unto thee, O first-enthroned Peter: If thou lovest Me, feed My sheep. And He Who said: I am Jesus, said of thee, O preeminent Apostle Paul: He is a chosen vessel unto Me, to bear My name before the gentiles. And likewise to all your colleagues, His apostles, He said: As My Father hath sent Me, even so send I you; go ye, and teach all nations. And ye, receiving such grace from your good Chief Shepherd, as the foremost shepherds and teachers of all the world, from all misfortunes preserve ye us on the pasture of salvation, that we may cry out to you: Rejoice, O holy first-enthroned Peter and Paul, with all the holy apostles! Rejoice, mighty pillar and ground of the Orthodox Faith! Rejoice, first-seated among the council of the apostles! Rejoice, renowned physician for them that repent of their sins! Rejoice, thou who didst forsake corruptible nets and didst fish the whole world with incorruptible ones! Rejoice, O ye who like a pair of steeds were harnessed by God to His chariot of noetic light! Rejoice, for through you the Faith which saveth us hath shone forth from Christ in every place! Rejoice, O holy first-enthroned Peter and Paul, with all the holy apostles! O teacher of the gentiles, who received thy title wondrously from on high, thou didst believe when Jesus said unto thee: Saul, why persecutest thou Me Who cannot be touched by unbelief? Yet believe thou henceforth; for, lo! contrary audacity darkeneth thee, but I have chosen thee to be a witness to My judgments before the rulers, the nations and the children of Israel. And thou, O Apostle Paul, called such things by God, didst cry out: Alleluia! Rejoice, chosen vessel which pourest forth the sweetness of the Faith of Christ upon all men! Rejoice, thou who more than others wast enlightened by grace after the shadow of the Old Covenant! Rejoice, thou who with His strength didst dare to denounce them that were adamant in their unbelief! Rejoice, thou who, following Christ, didst labor more than others for the salvation of man! Rejoice, ye who stand before the throne of the Most High like two seraphim! Rejoice, for ye are the stars which crown the Church, the Bride of Christ! Thou wast struck with horror, O holy Apostle Peter, beholding the sheet descending from on high, filled with all manner of living creatures, moreover with unclean beasts, wherein was set forth a parable of God's love for man, signifying that it is not fitting to reject them that from all the nations desire to believe in Christ Jesus. And understanding this mystery, thou didst cry out to God: Alleluia! Rejoice, thou who not only watchest over men, but over the affairs of all the nations! Rejoice, thou who perfectest our meager repentance with thy mercy! Rejoice, thou who by thy supplication raisest up those dead of body and soul! Rejoice, thou who woundest the unbelieving with thy words, as with darts! Rejoice, ever-vigilant guides watching over the new Israel! Rejoice, O our instructors, who keep watch over the souls of Christians! To the Jews living in Damascus didst thou begin to preach, O apostle Paul, enlightened of God, that they might believe in Christ Jesus the Son of God; and they were astonished at how one who before had persecuted them that believed in the name of Christ had - O, the wonder! - himself been transformed into a believer! Wherefore, they took counsel together to slay thee; but knowing their intent and the hardness of their hearts, thou didst leave them in the blindness of their unbelief and, let down over the wall in a basket by the faithful, thou didst cry out to God: Alleluia! Rejoice, teacher of piety with thunderous voice, denouncer of ungodliness! Rejoice, true guide to the straight path! Rejoice, helmsman who guidest us to the haven of the pleasing of God! Rejoice, healer who acceptest no recompense for curing ailments of body and soul! Rejoice, for ye are like two wings given to her, the dove, by the Holy Spirit! Rejoice, for where Christ was in the body, there were ye gathered together! Sweating from thine earthly labors and providing for thyself by fishing, O holy Apostle Peter, thou wast called to be an apostle and didst believe in Christ Who nurtureth abundantly, Who fed a thousand people with five loaves; and thou didst follow Him, laboring for food which perisheth not, but abideth unto everlasting life; and thou didst cry out to Him as God: Alleluia! Rejoice, thou who didst rend asunder the false threats of the Pharisees and Sadducees like a spider's web! Rejoice, thou who grantest sight to the blind and the ability to walk to the lame! Rejoice, thou who didst heal them that suffered from many unclean spirits! Rejoice, thou who drawest the unbelieving to faith as if they were voiceless fish! Rejoice, for ye are like two grapes of the voice, which nourish us and make us glad! Rejoice, for ye are good husbandmen of the vineyard of Christ! An Israelite of the tribe of Benjamin, a Pharisee according to the law, a persecutor of the Church of God in thy zeal, didst thou call thyself, O holy Apostle Paul, not hiding thy former hot temper against them that believed in Christ Jesus; but as thou didst greatly persecute the Church of God and didst strive to destroy it, so now, gloriously adorned by thee, and made steadfast in might by thy mellifluous teachings, it crieth unto God: Alleluia! Rejoice, lover of Christ, named Paul, perfected in grace! Rejoice, star guiding them that languish in the depths of iniquity! Rejoice, thou who didst endure many tribulations and hast made others also steadfast to endure them! Rejoice, thou whose sweat-soaked kerchief healed the sick! Rejoice, ye who, like two lilies on its pillars, adorn the sanctuary of God! Rejoice, ye who through your fragrance dispel the stench of all iniquity! On thine arrival in Lydda, O blessed Apostle Peter, thou didst amaze the people living there when by the name of Jesus Christ thou didst raise up Æneas, who had lain abed, sick of the palsy, for eight years, and didst cause him to walk; in Joppa thou didst likewise, by thy supplication, return to life the dead Tabitha; and, summoned to Caesaria, thou didst enlighten with divine baptism Cornelius the centurion with all in his household. Wherefore, we all straightway cry aloud to God in unity of soul: Alleluia! Rejoice, thou who didst forbid the reception of recompense for holy things in the Church! Rejoice, thou by whom covetousness is cast away by sanctity as a type of idolatry! Rejoice, thou who didst fulfill well the commandment of Christ: ye cannot serve God and Mammon! Rejoice, thou who didst likewise commit Sapphira, who was guilty of that sin, to the same punishment! Rejoice, for ye are like two lamps radiating wisdom! Rejoice, for because of you is all like a fruitful olive tree in the house of God! Having attained unto the third heaven because of thy sanctity of body and soul and been enriched with ineffable benefactions, thou didst descend from thence, O divinely blessed Apostle Paul, and didst astonish all, filling those of the Jews and of the gentiles who believed in Christ with thy teachings of the knowledge of God. And together with them, all we, the faithful, who have a share of thine heavenly teaching, cry out to God: Alleluia! Rejoice, adamant firm of body and soul, who mightily endured all manner of tribulation! Rejoice, teacher invincible in the face of the Israelite teachers of the law! Rejoice, greatly fruitful branch which buddest forth from paradise, full of spiritual food! Rejoice, thou who hast fed the faithful throughout the world with the produce of thy works as with most comely fruits! Rejoice, ye who put forth the fruit of life and good understanding! Rejoice, ye who have been transplanted to heaven as the garden of the heavenly Father! Thou wast possessed of an all-embracing concern for all who came to the Faith of Christ, O blessed Apostle Peter, that their heart and soul become one. Wherefore, thou didst appoint for their needs a minister, the chaste Stephen, and six other deacons; and thou thyself, together with the rest of the apostles, didst dedicate thyself to prayer and the preaching of the Word, instructing all the faithful, who cried out with oneness of mind to God: Alleluia! Rejoice, manful sword-bearer of Christ in the garden! Rejoice, thou who wast prepared for prison and death for the sake of thy Lord! Rejoice, thou who after the Lord's resurrection wast summoned to thy former dignity! Rejoice, thou who didst vow to forgive the weakness of the penitent many times over! Rejoice, teachers of love for God and neighbor! Rejoice, ye who left all and followed after Christ, and found all in Him! Great testimony didst thou produce from the sayings of the prophets concerning Christ in the face of the leaders of the Jews, and before the Procurator Festus and King Agrippa, O Apostle Paul, who wast called of God, and all were utterly set at naught; for many of the Jews quoted books to thee in their frenzy, and thou wast answered by both Festus and Agrippa falsely, and wast condemned to be sent to Rome. But, enduring everything with thanksgiving, thou didst cry out with the faithful to God: Alleluia! Rejoice, confessor of the one God in three Persons! Rejoice, thou who hast made all the pious steadfast in that confession! Rejoice, thou who didst utter words of truth and chastity in his presence! Rejoice, thou who didst manifestly denounce his error which is not consonant with the Faith of Christ! Rejoice, ye who call those of earth and beneath the earth to battle against evil! Rejoice, ye who have vanquished the kingdoms of the earth by faith and have received heavenly things! Having slain Iakovos, the brother of John, Herod went on to seize thee as well, O divinely blessed Apostle Peter; and he placed thee under heavy guard in prison to await execution. Yet while fervent prayer was being offered up by the Church for thy deliverance, the angel of the Lord loosed thy bonds and led thee through the gates, which opened of themselves, and thou didst think that thou wast beholding a dream. But when the angel departed, thou didst come to thy senses and didst truly realize that thou hadst been freed; and thou didst cry out to God in thanksgiving: Alleluia! Rejoice, renowned one who heard the divine voice of the Father from heaven! Rejoice, thou who didst most splendidly receive the overshadowing of the Holy Spirit in the cloud! Rejoice, thou to whom the majestic glory of the all-holy Trinity was made manifest! Rejoice, thou who, following Christ, didst accomplish thy departure on a cross in Rome! Rejoice, ye who from the east and the west revealed the promised land in heaven! Rejoice, ye who let the sweetness of salvation fall upon us! Rejoice, ye holy first-enthroned Peter and Paul, with all the holy apostles! We hymn thee who standest on equal footing with the cherubim, O most blessed Apostle Paul, who wast enlightened by divine wisdom in the third heaven; for, hearing ineffable words there which it is not lawful for a man to utter, thou didst travel the whole world therewith, teaching all to believe in the crucified Christ, the Son of God, and to chant unceasingly unto Him as the true God: Alleluia! Rejoice, thou who bore witness before those of heaven, of earth and beneath the earth, concerning His name! Rejoice, thou who thus wast commanded by Him to bear witness also in Rome! Rejoice, thou who in the same Rome didst bow thine head beneath the sword, executed with Peter, who was crucified head downward! Rejoice, for this great wonder drew many soldiers to the Faith! Rejoice, ye who were shown forth by the confluence of the two rivers named Jor and Dan! Rejoice, for ye are like streams of sweetness which give all the faithful to drink from the cup of salvation! O most glorious and laudable disciples of Christ, Peter and Paul, first-enthroned and equally enthroned holy Apostles, who have enlightened all the universe with the holy Faith and will come with Christ to judge the whole world! Your proper dignity is not on earth, but is the glory and praise rendered in heaven. Accepting now our unworthy entreaty, by your worthy supplications preserve us from all misfortunes, and beseech Christ, the just Judge, to be merciful to us at the last judgment, that, saved by your mediation, we may chant unto God our Savior: Alleluia, alleluia, alleluia! (Thrice). The Lord Who said of Himself: I am the good Shepherd, said unto thee, O first-enthroned Peter: If thou lovest Me, feed My sheep. And He Who said: I am Jesus, said of thee, O preeminent Apostle Paul: He is a chosen vessel unto Me, to bear My name before the gentiles. And likewise to all your colleagues, His apostles, He said: As My Father hath sent Me, even so send I you; go ye, and teach all nations. And ye, receiving such grace from your good Chief Shepherd, as the foremost shepherds and teachers of all the world, from all misfortunes preserve ye us on the pasture of salvation, that we may cry out to you: Rejoice, O holy first enthroned Peter and Paul, with all the holy apostles! O most glorious Apostles Peter and Paul, who laid down your lives for Christ and beautified His pasture with your blood! Hearken unto the prayers and sighs of your children which are now offered up with contrite heart. For, lo! we have darkened ourselves with iniquities, and for this cause have we been covered with misfortunes as with showers; and we have become exceeding poor in the oil of a good life, and we cannot fend off the ravening wolves which boldly strive to lay hands on the inheritance of God. O ye mighty ones! bear ye our infirmities and separate yourselves not from us in spirit, that we not depart utterly from the love of God; but with your mighty assistance defend us, that the Lord have mercy on us all for the sake of your prayers, that He rend asunder the handwriting of our countless sins, and that He vouchsafe us with all the saints the blessed kingdom and the wedding feast of His Lamb, to Whom be honor and glory, thanksgiving and worship, unto the ages of ages. Amen. O holy Peter, chief of the apostles, rock of faith fixed firmly upon Christ, the chief Cornerstone, through thy confession! Pray thou that, unmoved by the imaginations of my mind and carnal lusts, I, too, may through faith be fixed firmly upon this same Christ, the Rock living, chosen and precious; that through love I may be made perfect as a temple of the Spirit, wherein I may offer up spiritual sacrifices unto Jesus Christ our God. O holy Paul, chief of the apostles, chosen vessel of Christ, overflowing with grace and the glory of God! Entreat thou the Creator, Who hath authority over creation, that He make of me, who am now a vessel of perdition, a vessel of honor for Himself, sanctified and fitting, ready for every good work, unto the ages of ages. Amen. O ye foremost of the apostles: Peter, steadfast exponent of the Faith of Christ, and Paul, melodious swallow of the teaching of the Lord! We perceive you to be a much-flowing river recounting the words of Christ, gushing forth from the breast of the Lord, disclosing to us the depths of the well of divinely revealed truths. We see you to be lamps which make things clear for us with streams of the fervor of divine love from heaven. We bless you, for ye endured tribulation and pain to sow the seed of divine teaching, and with your footsteps went round all the ends of the earth. With compunction we entreat you, O holy Apostles: cause us, in our sinful foolishness, to fall prostrate before the Lord, our Teacher; cause ye that the head of our pride be cut off, and haste ye to raise us up by your unceasing supplications, that there, with the choir of the angels and the apostles, we may glorify the Father of all, Who is wondrous in His saints, Who sent our Lord Jesus Christ into the world, and the Holy Spirit, Who is one in essence with Them, unto the ages of ages. Amen. O holy Peter, chief of the apostles, rock of faith steadfast in thy confession, foundation of the Church immovable in Christ, pastor of the rational flock of Christ, keeper of the keys to the kingdom of heaven, fisherman most wise who from the depths of unbelief dost draw forth men! Thee do I humbly entreat, that the net of thy divine draught encompass me and draw me forth from the abyss of perdition. I know that thou hast received from God the authority to loose and to bind; release me who am bound fast with bonds of sin, show forth thy mercy on me, wretch that I am, and give life to my soul which hath been slain by sins, as before thou didst raise up Tabitha from the dead; restore me to the good path, as before thou didst restore the lame man at the Beautiful Gates, who had been lame from his mother's womb; and as thou didst heal all the infirm by thy shadow, may the grace given thee by God overshadow me, healing my ailments of body and soul. For thou canst do all things, O holy one, through the power of Christ, for Whose sake thou didst forsake all to follow in His steps. Wherefore, pray thou to Him in my behalf, wretch that I am, that by thy supplications He may deliver me from all evil and teach me with a pure heart to send up glory to the Father, and to the Son, and to the Holy Spirit, now and ever, and unto the ages of ages. Amen. O holy Paul, eminent among the apostles, chosen vessel of Christ, recounter of heavenly mysteries, teacher of all the nations, clarion of the Church, renowned orator, who didst endure many misfortunes for the name of Christ, who didst traverse the sea and didst go about the land, and didst convert us from the deception of idolatry! Thee do I entreat and to thee do I cry: disdain me not, defiled as I am, but raise me up who have fallen through sinful sloth, as in Lystra thou didst raise up the man who had been lame from his mother's womb; and as thou didst give life unto Euthyches who lay dead, so also raise me up from my dead works; and as at thine entreaty the foundation of the prison once quaked and thou didst loose the bonds of the prisoners, so draw me out of the snare of the enemy, and strengthen me to do the will of God. For thou canst do all things by the authority given thee by God, to Whom is due all glory, honor and worship, with His unoriginate Father and His all holy, good and life-creating Spirit, now and ever, and unto ages of ages. Amen.